حسینی, مرجان, کلنگی, حامد, آزادی, حامد, امیری, امید. (1397). مقایسه برخی پارامترهای ایمنی غیراختصاصی موکوس پوست گاوماهی زرد و گاوماهی خالدار. فصلنامه محیط زیست جانوری, 10(3), 265-270. مرجان حسینی; حامد کلنگی; حامد آزادی; امید امیری. "مقایسه برخی پارامترهای ایمنی غیراختصاصی موکوس پوست گاوماهی زرد و گاوماهی خالدار". 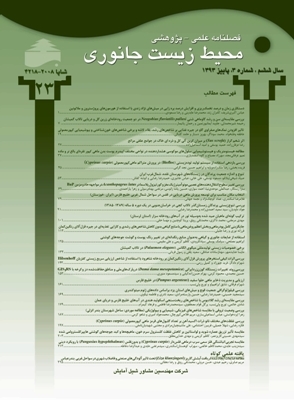 فصلنامه محیط زیست جانوری, 10, 3, 1397, 265-270. حسینی, مرجان, کلنگی, حامد, آزادی, حامد, امیری, امید. (1397). 'مقایسه برخی پارامترهای ایمنی غیراختصاصی موکوس پوست گاوماهی زرد و گاوماهی خالدار', فصلنامه محیط زیست جانوری, 10(3), pp. 265-270. حسینی, مرجان, کلنگی, حامد, آزادی, حامد, امیری, امید. مقایسه برخی پارامترهای ایمنی غیراختصاصی موکوس پوست گاوماهی زرد و گاوماهی خالدار. فصلنامه محیط زیست جانوری, 1397; 10(3): 265-270. تحقیق حاضر با هدف مقایسه پارامتر های ایمنی موکوس پوست گاوماهی زرد (Neogobius pallasi) و گاوماهی خالدار (Neogobius melanostomus) انجام شد. از تعداد 10 عدد ماهی به­ترتیب 5 عدد از هر گونه نمونه­برداری موکوس صورت گرفته و فاکتورهای ایمنی غیراختصاصی شامل: پروتئین محلول، لیزوزیم، آلکالین فسفاتاز قلیایی و ایمنوگلوبولین کل موکوس دو گونه اندازه­گیری شد. پس از پایان آزمایش مشخص شد که میزان پروتئین محلول (به­ترتیب 0/22±3/14 و 0/32±1/23)، ایمنوگلوبولین کل (به­ترتیب 0/02±0/48 و 0/12±1/09)، آلکالین فسفاتاز (به­ترتیب 0/89±41/19 و 1/52±30/88) و مقدار لیزوزیم (به­ترتیب 1/00±10/60 و 0/67±8/87) بود. اختلاف معنی­داری بین سایر پارامترهای اندازه­گیری شده در دو گونه وجود داشت (0/05>P) و به­طورکلی میزان این پارامترها در گاوماهی زرد بالاتر از گاوماهی خالدار بود. در مجموع با توجه به نتایج به­دست آمده می­توان گفت موکوس می­تواند نقش مهمی در ایمنی غیراختصاصی داشته باشد و تفاوت­های دو گونه در مورد واکنش به شرایط استرس­زا را می­توان تا حدودی به پارامترهای ایمنی غیراختصاصی موکوسی نسبت داد. Abraham, S.M. ; Sharon, N. and Ofek, I., 1999. Adhesion of bacterial to mucosal surfaces. Mucosal Immunology. Academic Press, San Diego, London. Vol. 3, pp: 31-42. Agarwa, S.K. ; Banerjee, T.K. and Mittal, A.K., 1979. Physiological adaptation in relation to hyperosmotic stress in the epidermis of a fresh water teleost Barbus sophor (Cypriniformes, Cyprinidae): a histochemical study. Z. Mikrosk. Anat. Forsch. Vol. 93, pp: 51-64. Alexander, J.B. and Ingram, G.I., 1992. Non cellular non specific defence mechanisms of fish. Annu. Rev. Fish Dis. Vol. 2, pp: 249-279. Choi, S.H. ; Park, K.H. ; Yoon, T.H. ; Kim, J.B.; Jang, Y.S. and Choe, C.H., 2008. Dietary Korean mistletoe enhances cellular non-specific immune responses and survival of Japanese eel (A. japonica). Fish and Shellfish Immunology. Vol. 24, pp: 67-77. Clark, DP. ; Durell, S.; Maloy, WL. ; Zasloff, M. and Rana, L., 1994. A novel antimicrobial peptide from bullfrog (Rana catesbeiana) skin, structurally related to the bacterial antibiotic, polymyxin. J Biol Chem. Vol. 14, pp: 10849-10855. Dhotre, M.A. ; Bansode, P.D. and Shembekar, V.S., 2013. Extraction, Biochemical characterization and antibacterial activity of fish mucus. Indian Streams Res J. 2 Suppl. Vol. 12, pp: 1-8. Edwards, E.A. and Twomey, K.A., 1982. Habitat susceptibility index models: common carp. U.S. Dept. Int. FishWildl. Serv. FWS/OBS-82/10.12. pp: 1-28. Ellis, A.E., 1974. Non-specific defense mechanisms in fish and their role in disease processes. Dev. Biol. Stand.Vol. 49, pp: 337-352. Fagan, M.; O'Byrne-Ring, N.; Ryan, R.; Cotter, D.; Whelan, K. and Mac Evilly, U., 2003. A biochemical study of mucus lysozyme, proteins and plasma thyroxine of Atlantic salmon (Salmo salar) during smoltification. Aquaculture. Vol. 222, pp: 287-300. Fast, M.D. ; Sims, D.E., Burka, J.F. ; Mustafa, A. and Ross, N.W., 2002. Skin morphology and humoral non-specific defence parameters of mucus and plasma in rainbow trout, coho and Atlantic salmon. Comp. Biochem. Physiol. Vol. 132, pp: 645-657. Hankock, R.E. and Diamond, G., 2000. The role of cationic antimicrobial peptides in innate host defences. Trends in Microbiology. Vol. 8, pp: 402-410. Harris, J.E. ; Watson, A. and Hunt, S., 1973. Histochemical analysis of mucous cells in the epidermis of brown trout Salmo trutta L. J Fish Biol. Vol. 5, pp: 345-351. Hellio, C.; Pons, A.M.; Beaupoil, C.; Bourgougnon, N. and Gal, Y.L., 2002. Antibacterial, antifungal and cytotoxic activities of extracts from fish epidermis and epidermal mucus. Int. J. Antimicrob. Agents. Vol. 20, pp: 214-219. Iger, Y. and Abraham, M., 1994. The process of skin healing in experimentally wounded carp. J. Fish Biol. Vol. 36, pp: 421-437. Ingram, G.A., 1980. Substances involved in the natural resistance of fish to infection, a review. J. Fish Biol. Vol. 16, pp: 23-60. Jung, T.S. ; Castillo, C.S.D. ; javaregowda, P.K. ; Dalvi, R.S. ; Nho, S.W., Park, S.B. ; Jang Cha, I.S. ; Sumg, I.S., Hikima, J. and Aoki, T., 2012. Seasonal variation and comparative analysis of non-specific humoral immune substances in the skin mucus of olive flunder (Paralihthys olivaceus). Developmental & Comparative Immunology. Vol. 14, pp: 23-34. Kaattari, S.L. and Piganell, J.D., 1996. The specific immune system: humoral defense. In: Iwama, G., Nakanishi, T. (Eds. ), The Fish Immune System. Academic press, NewYork. Vol. 25, pp: 207-254. Kitani, Y.; Kikuchi, N.; Zhang, G.; Ishizaki Shimakura, K.; Shiomi, K. and Nagashima, Y., 2008. Antibacterial action of L-amino acid oxidase from the skin mucus of rockfish Sebastes schlegelii. Comp. Biochem. Physiol. Vol. 149, pp: 394-400. Laemmli, U.K., 1970. Cleavage of structural proteins during the assembly of the head of bacteriophage T4. Nature. Vol. 227, pp: 680-685. Negus, V.E., 1963. The functions of mucus. Acta oto laryngol. Vol. 56, pp: 204-214. Pickering, A., 1974. The distribution of mucus cells in the epidermis of the brown trout Salmo trutta (L.) and the char Salvelinus alpinus (L). J. Fish Biol. Vol. 6, pp: 111-118. Rao, V.; Marimuthu, K.; Kupusamy, T.; Rathinam, X.; Arasu, MV. and Al-Dhabi, N.A., 2015.Defense properties in the epidermal mucus of different freshwater fish species. AACL Bioflux. 8 Suppl. Vol. 2, pp: 184-194. Ross, N.W. ; Firth, K.J. ; Wang, A.; Burka, J.F. and Johnson, S.C., 2000. Changes in hydrolytic enzyme activities of naïve Atlantic salmon Salmo salar skin mucus due to infection with the salmon louse Lepeophtheirus salmonis and cortisol implantation. Dis. Aquat. Org. Vol. 41, pp: 43-51. Sangeetha, S.; Shawna, L.M. and Neil, W.R., 2007. A comparative study on innate immune parameters in the epidermal mucus of various fish species. Comparative Biochemistry and Physiology, Part B. Vol. 148, pp: 256-263. Shephard, K.L., 1993. Mucus on the epidermis of fish and its influence on drug delivery. Adv. Drug Deliv. Rev. Vol. 11, pp: 403-417. Subramanian, S.; MacKinnon, Sh.L. and Ross, N.W., 2007. A comparative study on innate immune parameters in the epidermal mucus of various fish species. Comprative Biochemistry and Physiology, Part B. Vol. 148, pp: 256-263. Subramanian, S.; Ross, N.W. and MacKinnon, Sh.L., 2008. Comparison of antimicrobial activity in the epidermal mucus extracts of fish. Comparative Biochemistry and Physiology. Vol. 15, pp: 85-92. Suzuki, Y.; Tasumi, S.; Tsutsui, Sh. ; Okamoto, M. and Suetake, H., 2003. Molecular diversity of skin mucus lectins in fish. Comprative Biochemistry and Physiology Part B. Vol. 136, pp: 723-730. Siwicki, A.K. and Anderson, D.P., 1993. Nonspecific defense mechanisms assay in fish: II. Potential killing activity of neutrophils and macrophages, lysozyme activity in serum and organs and total immunoglobulin level in serum. Fish Disease Diagnosis and Prevention Methods Olsztyn, Poland. Vol. 10, pp: 5-12. Tabak, L.A., 1995. In defense of the oral cavity: structure biosynthesis and function of salivary mucins. Annu. Rev. Physiol. Vol. 57, pp: 547-564. Timalata, K.; Marimuthu, K.; Vengkades, R.; Xavier, R.; Rahman, MA. and Sreeramanan, S.,2015. Elucidation of innate immune components in the epidermal mucus of different freshwater fish species. Acta Ichthyol Piscatoria. Vol. 3, pp: 221-230. Villarroel, F.; Bastías, A.; Casado, A.; Amthauer, R. and Concha, M.I., 2007. Apolipoprotein A-I, an antimicrobial protein in Oncorhynchus mykiss: evaluation of its expression in primary defence barriers and plasma levels in sick and healthy fish. Fish Shellfish Immunol. Vol. 23, pp: 197-209. Whyte, S.K., 2007. The innate immune response of finfish e a review of current knowledge. Fish Shellfish Immunol. Vol. 23, pp: 1127-1151.